Is the necessary SIL related to layers of protection or operating practices? A safety integrity level is a quantification of the necessary risk reduction we need from an automated safety system to achieve acceptable risk levels for some industrial system. 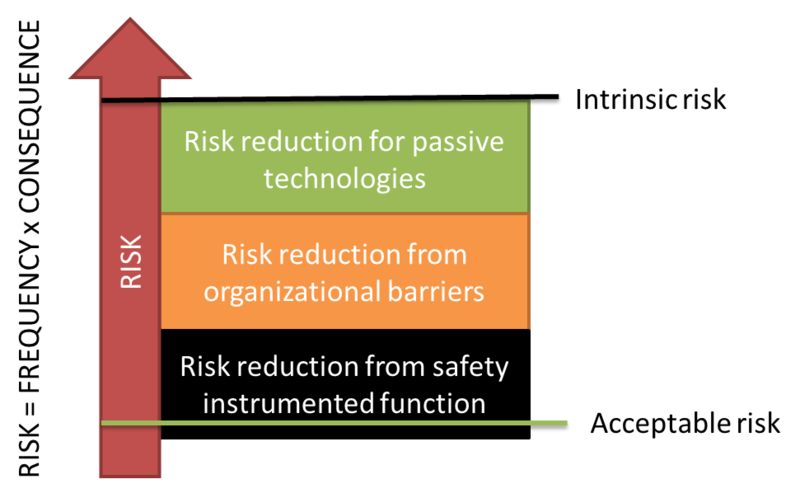 The necessary risk reduction, obviously depends also on other activities and systems we put in place to reduce risk from its “intrinsic” level. The following drawing illustrates the role of different things we can do to achieve acceptable risk for a technical asset. Figure showing how risk reducing measures work together to bring the risk down to an acceptable level. Consider for example a steel tank that is filled with pressurized gas. One potential hazard here is overpressure in the tank, which may cause a leak and the gas can be both toxic and flammable – obviously a dangerous situation. When working with risk, we need to define what we mean by risk in terms of “acceptance criteria”. In this case, we may say that we accept an explosion due to leak of gas and ignition of the gas afterwords once every one million years – that is a frequency of 10-6 per year. The initial frequency is maybe 0.1 per year, if the source of the high pressure is a controller intended to keep the pressure steady over time by adjusting a valve. Normally, such process control loops have one malfunction every 10 years (a coarse rule of thumb). Passive technologis can here be a spring-loaded safety valve that would open on high pressure and let the gas out to a safe location, for example a flare system where the gas can be burnt off in a controlled manner. This reduces the probability by 99% (such a passive valve tends to fail no more often than 1 out of 100 times). In addition to this, there is an independent alarm on the tank, giving a message to an operator in a control room that the pressure is increasing, and the oprator has time to go and check what is going on, and shut off supply of gas to the tank by closing a manual valve. How reliabile is this operator? With sufficient time, and allowing for some confusion due to stress, we may claim that the operator manages to intervene 9 out of 10 times (such numbers can be found by looking at human reliability analysis – a technique for assessing performance of trained people under various situations – developed primarily within the nuclear industry). In addition, a terrible explosion does not automatically happen if there is a leak – something needs to ignite the gas. Depending on the ignition sources we can assign a probability to this (models exist). For this case, let us assume the probability of ignition of a gas cloud in this location is 10%. We have now reduced the probability of this occuring by a factor of 1000 from an initial “intrinsic” frequency of 0.01. The frequency of such explosions due to leak in the tank before using any automatic shutdown system is thus 0.01 x 0.001 = 0.00001 = 10-5. The remaining reduction needed to bring the frequency down to 1 in a million years for the explosion is then an automated shutdown function that does not fail more than 1 out 10 demands – a PFD of 0.1. This means, we need a safety instrumented function with a probability of failure on demand of 0.1 – which corresponds to a SIL 1 requirement. The process we used to deduce this number is by the way known as a LOPA – a layers of protection analysis. The LOPA is one of many tools in the engineer’s toolbox for performing risk assessments. What this illustrates is that the requirement to an automated shutdown function depends on other risk mitigation efforts – and the reliability of those barrier elements. What if the operator does not have time to intervene or cannot be trusted? If we take away the effect of the operator’s actions we see immediately that we need a SIL 2 function to achieve acceptable level of safety. What does a “SIL” requirement really mean? Obtaining the necessary documenation from vendors – why is it so hard?